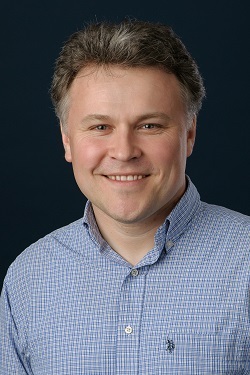 Felix Yarovinsky is an Associate Professor at the Center for Vaccine Biology and Immunology, Department of Microbiology and Immunology, University of Rochester Medical Center. He received his M.D. from Russian State Medical University, followed by post-doctoral training at NIH where he discovered an innate immune sensing mechanism for the recognition of protozoan parasites. In his current work he seeks to decipher how innate immune cells cooperate in the regulation of IFN-gamma responses to intracellular infections. His lab is also interested in mechanisms responsible for intestinal immunity and immunopathology. Toxoplasma gondii is a common food borne pathogen. It is estimated that 1.5 million people in the U.S. alone become infected with T. gondii annually and this protozoan parasite is the second most prevalent deadly food borne pathogen in United States. Surprisingly, the initial steps for T. gondii recognition by human cells remain largely unknown. I will discuss our system biology approach to define innate immune pathways based on the analysis of the effector molecules triggered by T. gondii infection in human monocytes, and the biochemical screening that allowed us to revealed a novel innate immune system for the recognition of this common pathogen. The event, sponsored by SMHS Host-Pathogen CoBRE, is open to everyone, and all are welcome.